We’d love to get you hooked on Georgian Bay fishing during your stay at Royal Harbour Resort. There are many fishing options, whether you want to catch a big salmon in blue waters of Georgian Bay, or catch a glimpse of fish in their habitat from an underwater camera. Select from our fishing charters below and reserve your trip. Call U’Catchem Charters for an exciting day of fishing on Georgian Bay. From April through November, you could catch Salmon, Lake Trout, Brown Trout and Rainbow Trout ranging from 1lb – 30lbs. Hop aboard one of two vessels – a 35′ Cooper Yacht, and a 26′ Thompson Sport Fisherman Hardtop. All safety and fishing equipment is provided, fully enclosed washrooms onboard, featuring Scotty Commercial Downriggers, Lowrance Sonar, GPS, VHF, and Auto Pilot. 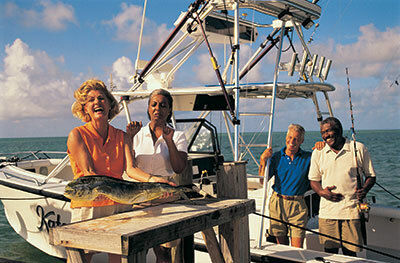 Charters are fully catered and a fish is guaranteed! Enjoy fishing on the beautiful open waters of Georgian Bay with Reel ‘Em In Charters located at the Thornbury Harbour. Most of all, you will enjoy the fresh air, clean water, and thrill of fishing for Salmon, Lake Trout, Rainbow Trout & Brown Trout. These fish will put up a good fight and give you some great eating. Choose a 4 or 6 hour charter, or a by-the-hour charter for an exciting, economical fishing adventure. Collingwood Adventure Voyages offers truly unique boat tour and cruises on Georgian Bay. Departing from Collingwood Harbour daily throughout May to October, Collingwood Adventure Voyages offers fishing charters, shipwreck tours, lighthouse tours and sunset cruises and provides a personal experience with small groups so you and your family get the most value possible. The Thornbury Fishway, also known by visitors and locals as ‘The Fish Ladder’ is located in the heart of Thornbury and can be viewed from Highway 26 as you enter Thornbury from the East. This passive fishway consists of an open channel with a relatively natural appearance that also allows for excellent fish viewing opportunities. From late August to late October, adult spawning Chinook Salmon begin showing up in the area rivers. They are aggressive jumpers and provide exciting viewing as they migrate up stream and make their way up the Fishway to find suitable areas in gravel river beds. The adult Chinook die after they have spawned. After the eggs hatch the young salmon return to the lake the following spring. In the Spring, watch for Rainbow Trout making their way up the Fishway. Adults enter the streams in early spring to spawn in clean, rapid water. The exact time varies but it is usually during April. New this year, the Ministry has installed an underwater camera and sensor at the fishway to track the type and number of fishway, along with data on the peak times of fish passage through the fishway. You can receive ‘real time’ and archived information about the number and type of fish travelling through the fishway by visiting the Biotactic website.